We are one of the well-known Exporters and Suppliers of Single Color Offset Printing Machine. Our company has earned a huge reputation for trading in modern Single Color Offset Printing Machine with On-Line Numbering and Perforation. 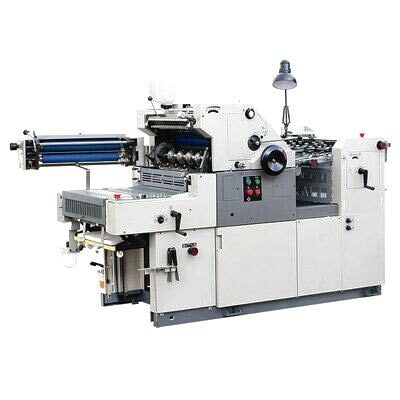 This Single Color Offset Printing Machine has many attractive features like low maintenance cost, easy operation, affordable price, power efficiency and timely delivery. We have also played a vital role in the improvement of the demands of the Single Color Offset Printing Machines. Our company has got a huge admiration in India as there is no substitute available to compete with the quality performance in many application areas. We are looking forward to entertain enquiries from Sri Lanka, Bangladesh, China, Taiwan, Mauritius, Malaysia, Syria, Philippines, Uganda, Kuwait, Abu Dhabi, Jeddah, Dammam, Algeria, Kenya, Liberia, Bhutan and Nepal. Our company is an ISO : 9001 Certified Company which has strict policies for maintaining high quality.